Father elder wise, I see discernment in your eyes. Wish I could do it over, wish on a four-leaf clover. Think not my child about the past it’s done it’s gone don’t make it last. Just remember this… then let it go. Next choice you make ask your heart, it knows. 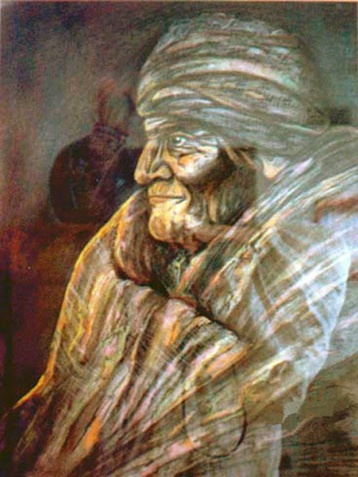 In this painting of Geronimo, he sits at night staring into the fire as it reflects on his weathered face deep in Discernment. He’s an elder wise and has been through night after dark night watching many moons come and go. Famous in his Apache tribe and famous in the white mans world. He healed as a medicine man, fought as a fearless warrior invincible to bullets. His wife and three children were slain in a massacre. Although he was never captured, he surrendered and lived the white mans lie, in truth died a prisoner of war. This medicine man traveled from innocence through to elder’s wisdom and returned full spiral with superior and moral understanding of Discernment. Everyone has experienced feelings of failure when proper Discernment wasn’t considered or exercised. In reverence to everything having a purpose and a lesson, all is perfect in the mind of God. Yet, in consideration for an easier pathway, let’s explore the mysteries of wisdom in Discernment. This mindfulness is profound personal understanding and clear judgment. Until you sit like Geronimo in front of the smoke, flames and fire. Cook, set off fireworks and get burned a few times, you don’t have a clue what fire can do. You can’t read it in a book and expect to actually know. It’s not a study based on correct ideas or traditional values, and rules. It is the perfection in your own acknowledgment of Spirit and an exercise in experiential moments and perception. Your heart’s natural wisdom is honored in Discernment. Your true nature seeks out ethics in all maters of the heart, love, integrity and inner beauty. These are honorable ideas born in your imagination, in your soul as spirit manifests into the physical infused into the very tapestry of your being. If you have chosen the medicine card, Discernment it is time to stop and feel into your heart’s innate compassionate knowing. What experiences have been teaching you about clearer Discernment? Consider wisely your power of choice.